“When the creek rises” was a three-part series about the historic West Virginia flood of 2016 and the ensuing inspirational rebuild of the golf courses at The Greenbrier, a historic resort in the southern part of the state. 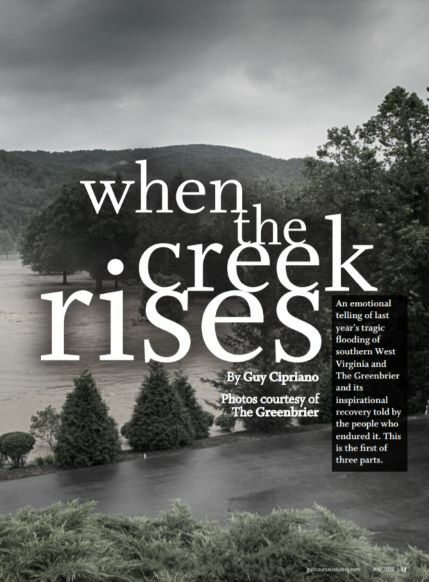 To tell the story of how The Greenbrier’s golf course maintenance team endured a horrific event to meet ambitious deadlines and elevate the morale of an entire region. The Greenbrier is the largest employer in southern West Virginia and golf is a key part of the resort, thus making it a giant economic driver. The teamwork, grit and talent required to rebuild The Old White TPC in time for the PGA Tour’s 2017 Greenbrier Classic helped the region recover from a natural disaster that didn’t receive significant national media coverage. 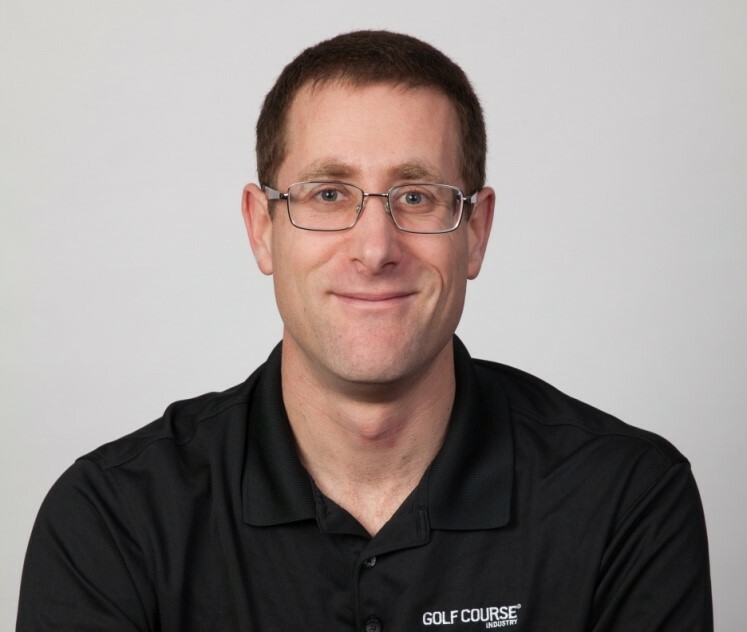 At Golf Course Industry, we try to tell stories that inspire and help others in the golf business. Learning the plight of The Greenbrier team helped many of our readers put their own problems into perspective. The people. The more time I spent in West Virginia, the more I realized this story extended beyond golf course maintenance or construction. 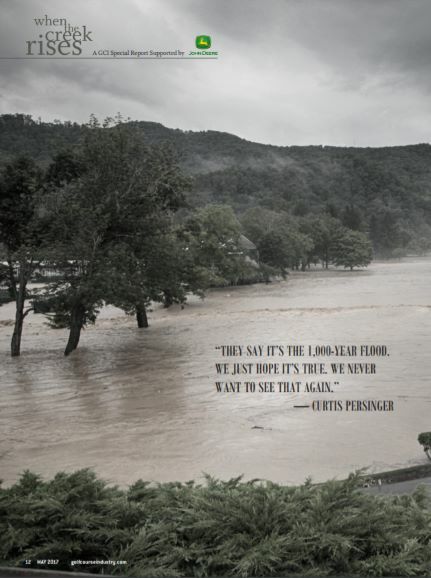 Everybody in Greenbrier County seemed to know somebody who lost a family member, friend or acquaintance in the flood. One member of The Greenbrier team lost a family member. Others lost their homes. Despite these losses, they all returned to their jobs and worked long hours to rebuild the golf courses. Not one person told me they considered leaving their job or the region following the flood. This series was about those people. They shared their story with a stranger, which isn’t easy to do. They also provided incredible access, despite overwhelming workloads. I’ll be forever grateful for the relationships established while working on this series. The human side of it. 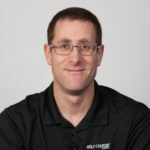 We sometimes focus so much on technical, agronomic and product stories that we forget about the people in the golf, lawn and sports turf businesses. And when we do write about people, we focus on key decision makers, such as golf course superintendents, landscape contractors and sports turf managers. General crew members, many who execute terrific work in anonymity, proved to be compelling subjects because of their loyalty to the resort and region. We were fortunate to have a tremendous partner in John Deere, which believed in the power of telling an inspirational people story to the golf industry. Our Golf Course Industry team made the series stand out and they provided me with the resources to spend as much time in West Virginia as I needed. The Hampton Inn in Lewisburg, W.V., developed into a second home; The Wild Bean became a second office; and John Denver’s “Take Me Home, Country Roads” ascended to the top of my playlist. There might only be one name on the byline, but Jim Blayney, Pat Jones, Russ Warner and Mike Zawacki deserve an equal amount of credit for this project’s success.